Over the past few years, my stance on soy has been somewhat neutral as I’ve been awaiting further research. I have never recommended or encouraged soy, due to the mixed and controversial information out there. Now, however, the literature is overwhelming. I decided it was time to outline what is known about soy so you can make your own informed decision. A lesson I’ve learned, yet again, is the importance of being open minded and to question everything. *This claim that soy foods prevent heart disease is based on the fact that soy foods lower cholesterol. Soy foods can lower cholesterol, however this is not necessarily a good thing. Lowering cholesterol does not prevent heart disease like we used to think, and can, in fact cause an increase in other disorders including cancer, autoimmune disorders, intestinal diseases, stroke, accidents, violent behavior, depression and suicide. The significant increase in heart disease in the United States has actually paralleled the great increase in the use of soy foods. Read more of my thoughts on cholesterol in this post and I strongly urge you to pick up a copy of Cholesterol Clarity and/or The Great Cholesterol Myth — two invaluable resources on heart health. Soy isoflavones are a class of phytoestrogens which mimic estrogen in the body. Altering estrogen levels is not beneficial for men OR women. For men, this can decrease sperm production, lower libido and cause weight gain. Higher levels of estrogen can put women at a greater risk for breast cancer and lower fertility. Soy negatively affects those with an existing thyroid condition because the isoflavones in soy interfere with production of T3 and T4, which is necessary for a well functioning thyroid. I see many clients who have struggled with hypothyroidism (an under-active thyroid) and the frustrations that accompany it, including a slowed metabolism and difficulty losing weight. I’ve also come across sources that believe soy can lead to hypothyroidism. Either way, it’s just not worth the risk. Personally, my thyroid is functioning just fine and I want it to stay that way! Many soy products endure a lot of processing before they reach your fork or cup and most soy in the United States is genetically modified. Processing is never a good thing. That being said, I think soy products that are minimally processed, such as miso or edamame, are fine in moderation. Soybeans are high in phytic acid, just like grains and legumes, which inhibit absorption of several minerals like magnesium, calcium, copper, zinc and iron and can lead to mineral deficiencies. Why put something into your body that isn’t helping you get the most nutrition from your foods? Soy products can cause gastric distress such as gas and bloating because soy is difficult to breakdown and digest. This can wreak havoc on gut health. Soybean allergy is one of the more common food allergies. I’ve experienced mild allergic reactions from soy first-hand. It took me a while to make the connection, but when I would drink a latte made with soy milk, my throat and ears would get itchy and my eyes would water. It’s not a severe allergic reaction, but an uncomfortable and obvious sign my body was trying to tell me that I was putting something in it didn’t like. And if those are the symptoms I'm exhibiting on the outside, it makes me wonder what's happening on the inside. (Hint: Inflammation.) Word of advice: always listen to your body. Soy foods increase the body's requirement for Vitamin D, which more than 90%of Americans are already low in. Last but not least on my list (there are many other reasons to avoid soy, but I chose to include the above list because to me they are the most important), long term use of soy products are not known. Just like long term usage of artificial sweeteners, it’s better to be safe than sorry. I do realize that soy is commonly used by those who are lactose intolerant or who follow a vegetarian or vegan lifestyle. If the reason is lactose intolerance, my suggestion is to use coconut milk, almond milk, or heavy whipping cream instead. I recommend that everyone avoid soy milk. In order to make soy milk, the soy is heated to an extremely high temperature and pumped with preservatives and stabilizers (and often times sweeteners too). And on the vegan/vegetarian topic: I am not an advocate of a vegan or vegetarian lifestyle that does not include at least some type of animal protein (such as eggs, fish or a whey protein powder) since our bodies receive so much benefit from these quality protein sources. If soy is being used as a protein replacement, I would recommend getting protein from a different source — even a plant based protein powder, which far outweighs the negative risks of soy if you ask me. For more on soy, check out The Whole Soy Story by Kaayla T. Daniel, PhD, CCN and work with a dietitian coach to learn how to navigate a balanced way of eating that works for you. Thank you for putting all of this info in one place. I had been avoiding soy simply because of the lack of information and I'm glad I was! I have two questions - flax is also a phytoestrogen, is it bad in the same way that soy is or is flax in a different class? You mention heavy whipping cream as an alternative for lactose intolerant folks - is there no lactose in heavy whipping cream? If that's true my husband will be SO HAPPY!!! Great post Cassie. That was really informative. I had my doubts about soy, now I know the real story! I recommend animal protein! But I also meet people where they are at and honor all choices. I have several clients who are vegans and I help them meet their nutrient needs while respecting their choices. Cassie, this doesn't address all of your points but as to the preservatives, processing, phytic acid and GMO: You can make your own soy milk at home and, consuming the strained solids (okara) it is also a whole food. Making it yourself means you can plump up your soy milk with whatever you like (I recommend a pinch of sea salt, a touch of raw sugar and a short infusion with a vanilla bean). I don't know how industrial soy products are made, but phytic acid is greatly reduced by soaking and cooking - something I recommend when making own soy milk at home. This also means that you can choose the soy beans - all soy from Europe / both conventionally or organically grown - they call it BIO) is not contaminated by GMO's. And, yes, my process uses a high temperature in a pressure cooker - but this just cuts down on cooking time - so if one was concerned about the affects of high temperature at which foods are cooked they can also make soy milk the regular way but boil it for about an hour. Like you said, there is many conflicting information about soy - but I hope I was able to clear to show you that there is another way. 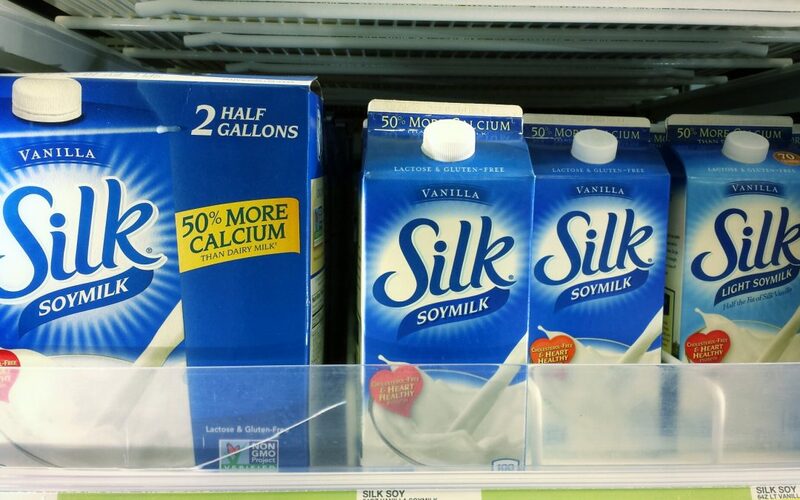 got soy milk? pressure cook it! I love that you're willing to keep an open mind! That's great! To each his own. I personally would not use soy nor would I use any of the Shaklee products. Soy is not fake food. Soybeans have been consumed for at least 3,000 years. How soy is processed matters tremendously in what you end up with (hint: not all soy is pumped full of preservatives, chemicals, etc.). Appreciate the comment. That's why I said in the article that I think soy products that are minimally processed, such as miso or edamame, are fine in moderation. For someone who is lactose intolerant, I recommend no dairy at all. I don't recommend soy in general for anyone, even those who are lactose intolerant. Almond milk is a fantastic alternative, albeit low in protein. You can definitely email us and we'll send you the research studies!